Adding a new hardwood floor to your home is an important step. You want to make sure you make the right choice with the floor and your hardwood flooring contractor. When searching for hardwood flooring contractors in Central Kentucky, look no further than Thomas Quality Construction. To get professional hardwood flooring installation results, your contractor needs the right tools and experience. At Thomas Quality Construction, we would be happy to work with you to select the appropriate hardwood flooring for your floor project. Nothing adds beauty and value to your home like a solid wood floor. Not only will a solid wood floor increase your home’s value, but it is durable enough to last a lifetime. Let Thomas Quality Construction help make your house a home with the beauty and warmth of a solid hardwood floor. Hardwood flooring comes in a wide range of species, designs, colors and stain types to meet your particular tastes and personal needs. The one thing people come in contact with every day in their homes is the floor. Having a beautiful and durable hardwood floor will bring years of joy to any home. Deciding on the best hardwood flooring for your home doesn’t have to be a difficult decision. Hardwood flooring has been around for centuries and has been one of the most dependable flooring options. With its ability to be stained, sanded and re-stained multiple times, hardwood flooring can become a great option to just about any environment. In a study of home buyer preferences by USA Today, using data from the National Association of Realtors, it was found that the majority of home buyers were willing to pay more for a home with hardwood flooring, especially among buyers under the age of 55. At Thomas Quality Construction, we understand it can be a very daunting task trying to decide on which hardwood flooring to be installed. However, once you have selected which hardwood flooring you want, we will then have the new hardwood flooring delivered to your home. We then let all hardwood flooring sit uninstalled for at least 4 to 6 days so that it can acclimate to the temperature in your home. Any company that tells you that they can do “next day” installation is not professional. All real hardwood flooring needs to acclimate to the right temperature in the home before installation. Once the hardwood flooring has become acclimated, our professional crew will come to your home and start the installation process. Depending on the square feet and design/layout of the installation this could take several days to a week or more for the installation to be completed properly. 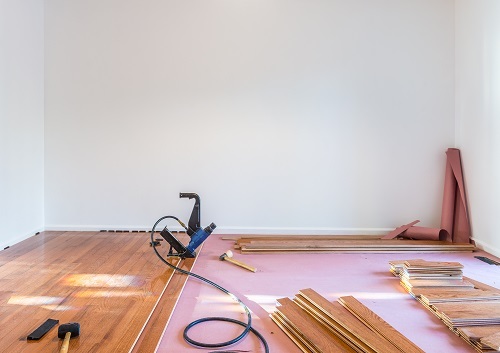 At Thomas Quality Construction, our experienced craftsmen are fully certified flooring contractors with extensive knowledge regarding the materials we use, as well as all of the finishes that are available. Our dust-free sanding and finishing service provides our clients with complete creative control to craft floors that are truly unique to your home. Each client’s installation is handled with the utmost care and craftsmanship. As one of the leading hardwood flooring contractors in Central Kentucky, Thomas Quality Construction specializes in working with home owners who value quality workmanship and reliable service.